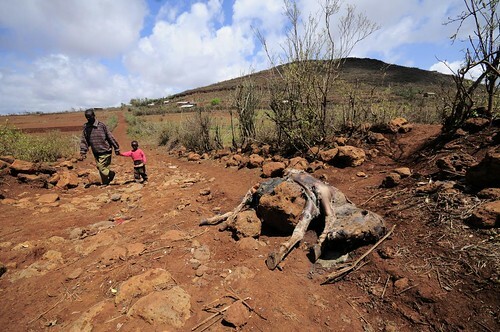 Children in Kenya’s Marsabit District pass one of thousands of carcasses of livestock that died in the drought in the Horn of Africa (photo on Flickr by Neil Palmer/CIAT). Voice of America reports today on ‘A new insurance program for poor livestock farmers in northern Kenya has made its first pay out to some 650 herders in the vast Marsabit District. ‘The settlement went to farmers who lost up to a one third of their animals. ‘The insurance project known as “Index Based Livestock Insurance” or IBLI, was developed in partnership by the Nairobi based International Livestock Research Institute, ILRI, and other international organizations. ‘It is funded by USAID, the European Union, the British government, World Bank and other financial and insurance groups. ‘One of the agricultural experts working on the project is Professor Michael R. Carter, director of Basis Research Program for the Department of Agriculture and Resource Economics at the University of California in Davis. . . .
‘Teams of researchers are in the field surveying and studying results of the first pay out to see how farmers are using the insurance money. Read the whole story at VOA: Kenyan pastoralists benefit from unique livestock insurance, 31 Oct 2011. Tags: 2011 Drought in Horn, DroughtInHorn2011, EU, IBLI, Marsabit, Michel Carter, University of California at Davis, USAID, World Bank. Bookmark the permalink.